Beautiful multi-utility box is made with beige color handmade paper having contrasting pink embroidery done on it. Being a leading enterprise of this industry, we are offering a huge range of Decorative Utility Boxes. Dimension: L-3.6" x W-3.5" x H-0.8"
This multiutility box is made from scrap or recycle wood thus maintaining its orignal color which makes each piece unique. This box is primarily used to keep tea bags etc. Due to its several racks, this colud also be used to keep many things like small jewelery, small tools, buttons etc hence making it a multiutility box. The Duck box is a unique product. 100 per cent handmade and shaped like a duck, the ulitily box will not only store your stuff but also add to your home decor. This 2-in-1 product is from the land of Kashmir and is made up of papier mache. Available in various vibrant colours and shapes too. Store your utilities in style with this box made of wood and brass. 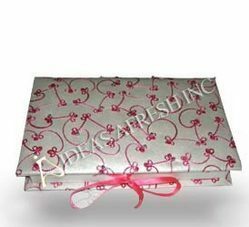 The form of art depicted on the box is called Alpana, which is a much known design among the folklore's. A perfect sized box for holding small treasures. Ideal place to store your rings or earrings while you sleep! 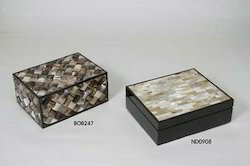 This box would also look great sitting on your desk to hold paper clips, push pins, rubber bands, or even loose change.